Brand new entertainment center with 60-foot front porch and custom-designed kitchen, great for catered and large group events. Sparkling, heated pool with a newly expanded patio, so you have plenty of room for sunning and chatting. Narrows Too is a great place for a rally, a reunion, a retreat. 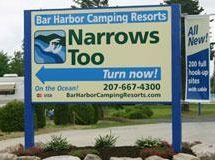 If your caravan has 25 people or more, call our Maine reservation office at(207) 288-8106 for special rates and all the details. Come for a few days…you’ll want to stay for the season!